This fact-filled, colorful look at the amazing world of bats includes a call to action to protect these creatures and their habitats. Written by Melissa Stewart and Illustrated by Higgins Bond, Hardcover, 32 pp. For ages 6-10. 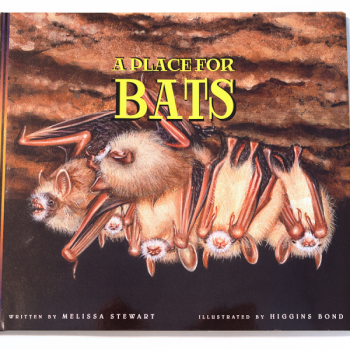 In simple yet informative language, A Place for Bats introduces young readers to the ways human action or inaction can affect bat populations and opens kids' minds to a wide range of environmental issues. Describing various examples, the text provides an intriguing look at bats, at the ecosystems that support their survival, and at the efforts of some people to save them. At the end of the book, the author offers readers a list of things they can do to help protect these special creatures in their own communities.